This is a simple German book converted into an Interactive ePub. 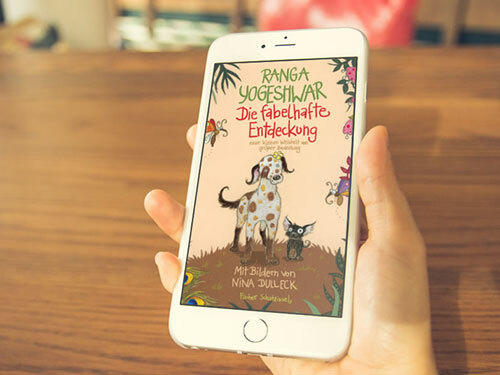 Our Client S. Fischer approached us to convert the book written by 'Ranga Yogeshwar' into an interactive ePub named 'Die Fabelhafte Entdeckung' especially for German children. Die Fabelhafte Entdeckung was one of our first highly interactive ePub. We took it up as a challenge to deliver something innovative and new. We managed to sync 2 pages of the book to showcase continuous movement of the animated characters which was not an easy task. This effort was successfully accomplished by our team. The ePub was made interesting with read aloud function, interactive audio, animations, all these enhanced the features which made the idea of reading more exciting for kids to relate to. The concept of converting a simple book into an interactive and engaging ePub helps inculcate the habit of reading in children.